Last week, scientists discovered a huge hole in the universe. It is billions of light years across. It is not a black hole; it is not a space filled with "dark matter", "anti-matter", "dark energy", or anything else. It is just nothing. No stars, no nothing. It was discovered by the Very Large Array (VLA) Radio Telescope. This region is 6 to 10 billion light years from us. Why this is important. The science of cosmology (the study of the origin of the universe) has been undergoing a process similar to the process Aristotle's model of the universe underwent over the roughly 1700 years from his day to the time of the Rennaissance. Aristotle based astronomy on the premise that the sun and all of the other objects in the sky orbited the Earth. As the years went by, more and more observations conflicted with this premise. Scientists developed complex mathematical models ("spheres within spheres") to account for these problems. The Aristotlean Universe went from a relatively simple modal in his day to a vastly complicated modal by the end of the Middle Ages. Then Copernicus advanced an entirely new modal of the planets orbiting the Sun. This simplified things greatly and has been accepted down to our day. The Big Bang theory is the commonly accepted modal nowadays for the origins of the universe. However, it has grown immensely complicated by subsequent observations. This vast void is the latest one. 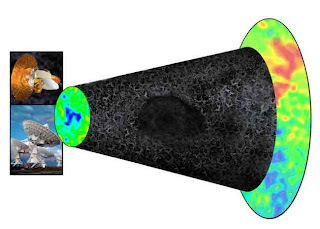 The Illustration: The effect of matter on the cosmic microwave background (CMB). On the right, the CMB is released shortly after the Big Bang, with tiny ripples in temperature due to fluctuations in the early universe. As the radiation traverses the universe, it experiences slight perturbations. In the direction of the giant newly-discovered void, the WMAP satellite (top left) sees a cold spot, while the VLA (bottom left) sees fewer radio-emitting galaxies. CREDIT: Bill Saxton, NRAO/AUI/NSF, NASA. Keep up the good work! Really looking forward to read through the first Chess Carnival. Jack, I put in my contribution to the blog carnival and will link back to it as soon as I can (I am on vacation starting in 5, 4, 3...). Also put up a reminder on my blog today. Thanks for starting it up!